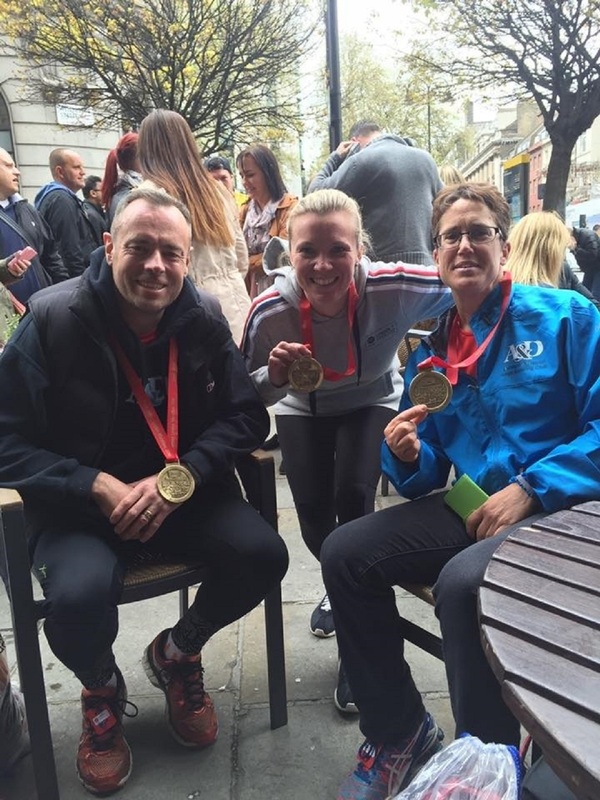 Runners from our club joined 38,000 other runners on the start line of the most famous marathon in the world – The London Marathon last Sunday. On a cold spring day, eight of the club’s runners lined up on the start line of the race at Greenwich Park, and there were many excellent performances. Scott Lynch and Danyel Giles both had races to remember, but for slightly different reasons. For Scott Lynch it was a challenge just to be on the start line after he broke his back and neck less than 20 months ago in an accident. Scott came home in a superb time of 3:14:44, 590th in his age category, and with this time he achieved a good for age place in next year’s race. Danyel Giles continued her rapid improvement this year, as she trimmed 10 minutes from her personal best, just a week after running the Brighton Marathon. Danyel finished the race strongly in a time of 3:49:27. Chris Valdus was the first club member home, as he broke the 3 hour barrier with a outstanding time of 2:56:55, 304th in his age category despite having his training for the race interrupted by illness. Mark Attenborough, after months of hard training behind him, ran a strong race to finish in an excellent time of 3:34:47. Helen Weeden, also running two marathons in a week after her personal best in the Brighton marathon last week, came home in 4:17:15, with Deborah Hainsworth finishing her first marathon in a time of 4:53:15. Another runner who took on the difficult challenge of running the Brighton and London marathons, was Steve Wellsted who came home in a time of 5:06:25. Jeremy Chambers, despite picking up an injury along the course, battled through the pain to finish in a time of 6:19:17.